Obsessed with travelling to the past, an astronaut and her French bulldog, Jezebel, explore the universe and attempt to unravel the mysteries of time travel. From distant galaxies full of nonverbal life forms all the way to Portland, Oregon, the astronaut is desperately searching in an attempt to crack the code. A tale of adventure, heroism, mortality and love, it's a modern day Turner and Hooch…meets Space Jam…meets Einstein’s theory of relativity. An interweaving of text, movement and an untrained bulldog, each show is a new adventure. Perhaps Jezebel was tired, or maybe she’s just lazy, but for the amount of time she spent obediently out of the way (albeit in the middle of the stage but that was clearly on purpose) I was almost convinced she was trained, despite what the program says. That coupled with her frankly stellar comedic timing, at least at my show, I was almost tempted to double check with the performer. Ultimately, the show reads as a love note to man’s best friend, and even though I am a cat person at heart, I not only completely empathized but totally understood the lengths at which she would go to keep her pup around. Wonderfully physical, funny and light-spirited, dog lover or not you’ll walk out feeling happy. Cats or Dogs?… If you said Dogs, we’ve got the show for you! 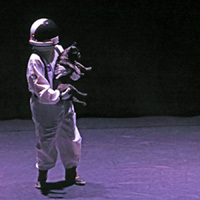 An astronaut and her dog, Jezebel, travel through space to figure out how to time travel so that Jezebel never has to die. There is a real dog in the show, she loves meeting new audience members.